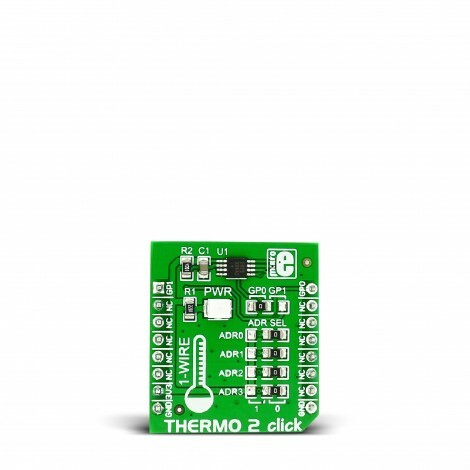 THERMO 2 click carries DS1825, a programmable resolution digital thermometer IC with a unique 64-bit address. The click is designed to run on a 3.3V power supply. The board communicates with the target microcontroller through a 1-wire interface. Using the onboard jumper you can select between two outputs: GP1 (default mikroBUS™ AN pin), and GPO (default PWM pin). 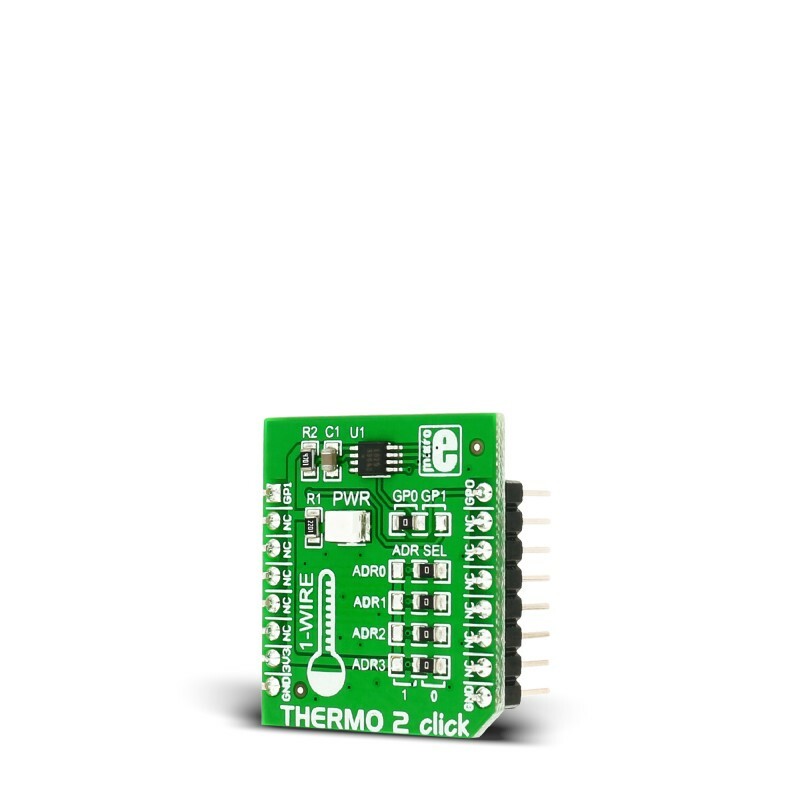 The sensor aboard THERMO 2 click measures temperature within a range from –10°C to 85°C with ±0.5°C accuracy. You can specify the resolution of the measurements, from 9 to 12-bit, depending on the application. Because each DS1825 has a unique 64-bit serial code, many of them can function on the same 1-wire bus. 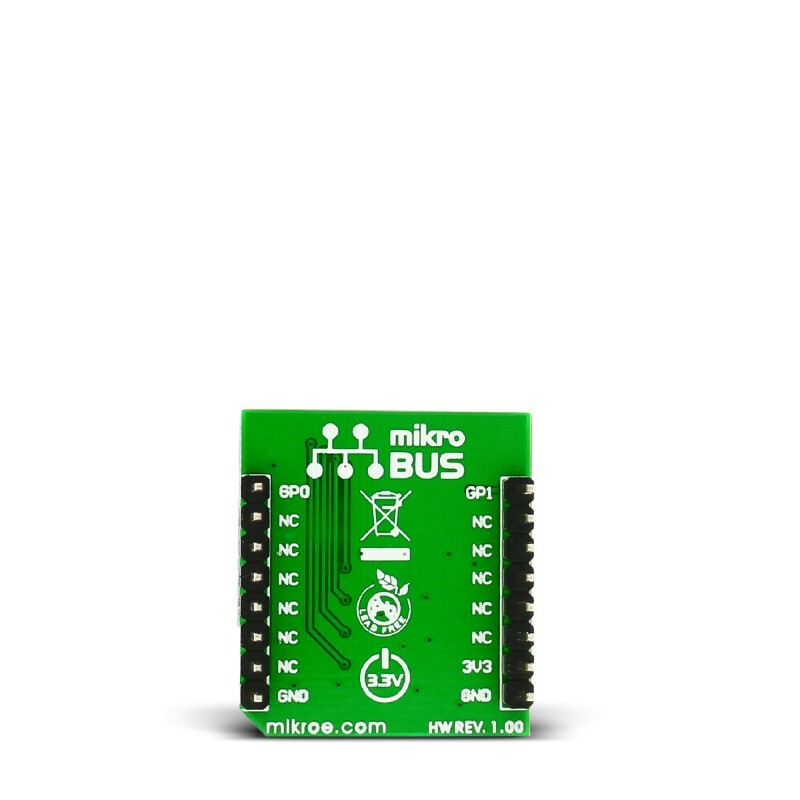 The 4-bit location address lets you set up a unique ID for up to 16 sensors that operate on a single 1-Wire bus. 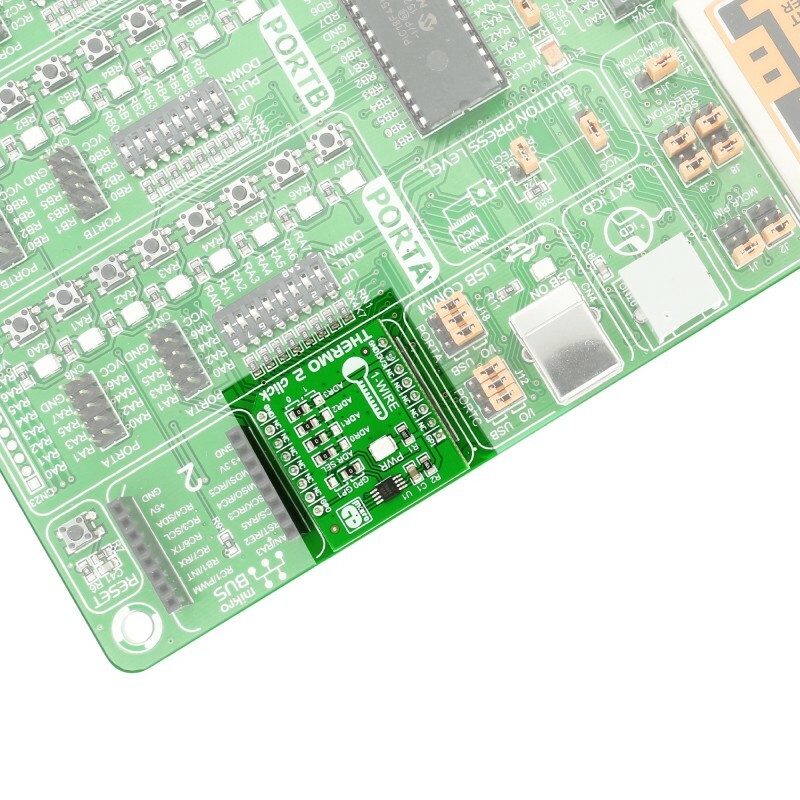 The board features a set of four onboard jumpers (zero ohm resistors) for specifying a unique address for the sensor. A separate jumper lets you select the sensor’s output between GP1 and GP0 pins. THERMO 2 click also features four Address Select jumpers for setting a unique ID for the sensor (allowing for up to 16 sensors to operate on a single 1-Wire bus). This table shows how the pinout on THERMO click corresponds to the pinout on the mikroBUS™ socket (the latter shown in the two middle columns). Code examples for THERMO 2 click, written for MikroElektronika hardware and compilers are available on Libstock. This code snippet initializes the display and the digital thermometer, and starts the conversion in an enless loop, reads the scratch pad and displays the temperature.